The sheer joy these wee smalls experienced with today’s activity should be enough to send you right out to fetch some balls and bubbles for the children in your life. Oh my, but it was fun. 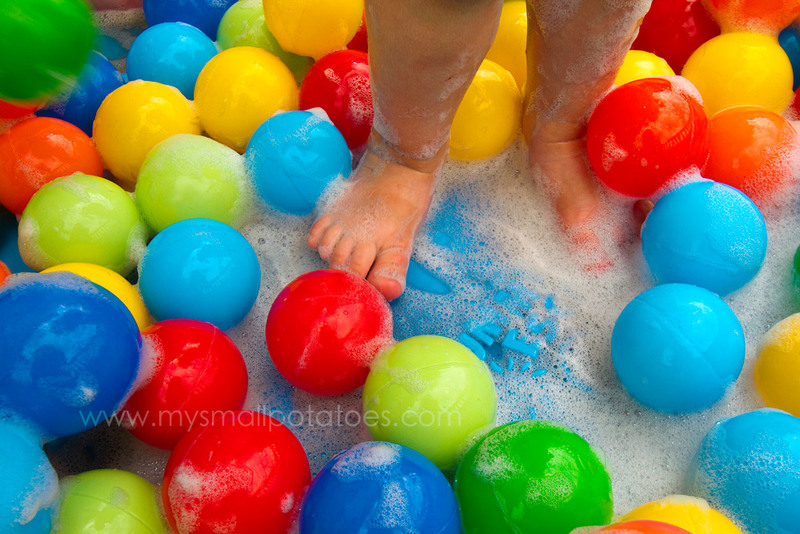 The giggles, the bouncy curls, the smiles, and the cutest bubbly feet you have ever seen kept me filling more buckets with suds than I had originally planned! You’ll need a bin or container big enough to hold a few or as many balls as you desire. We used our $10 puppy pool again. Seriously the best ten bucks I’ve ever spent! 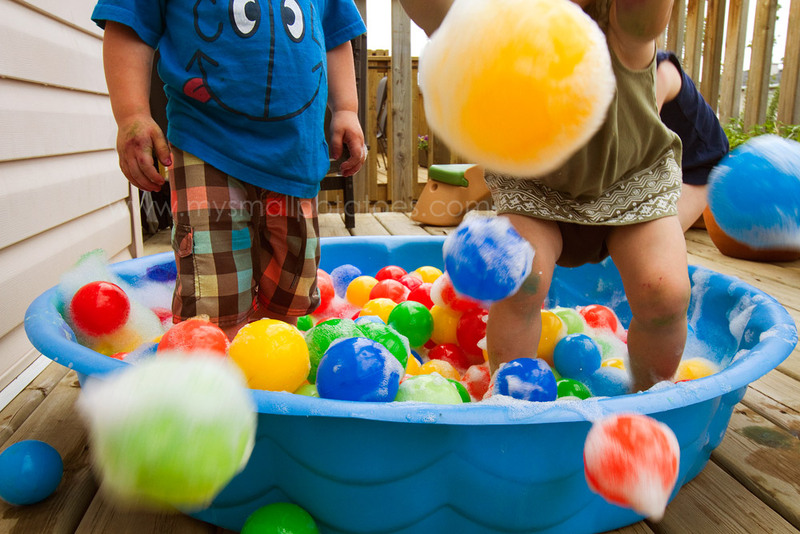 I used a bag of balls that go in the ball tents or ball pits you see at play places. We have a little ball tent we use for the babies and the extra balls were still in storage so I pulled them out for this activity. You can buy the balls quite inexpensively at Toys R Us or other department stores that carry toys. Even Wal-Mart has these. Now you’re going to have to make some suds. 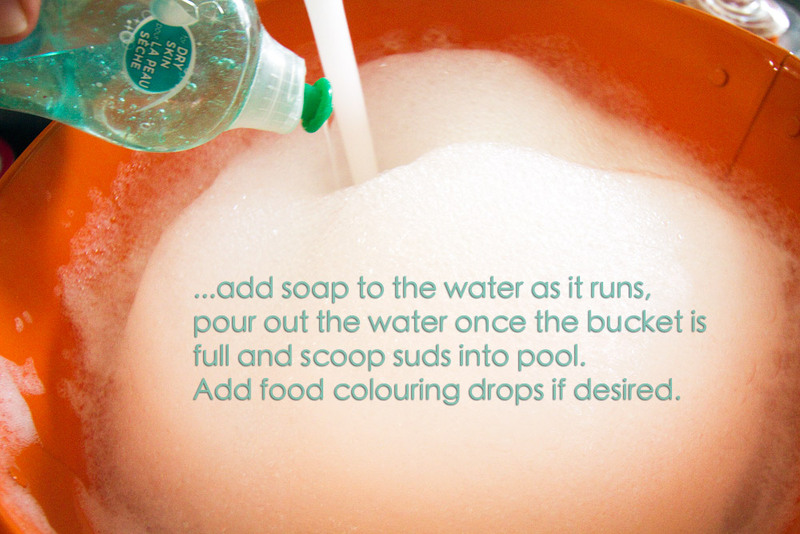 This is really very simple… You can add drops of food colouring to the foam after you have poured the water out. We did. 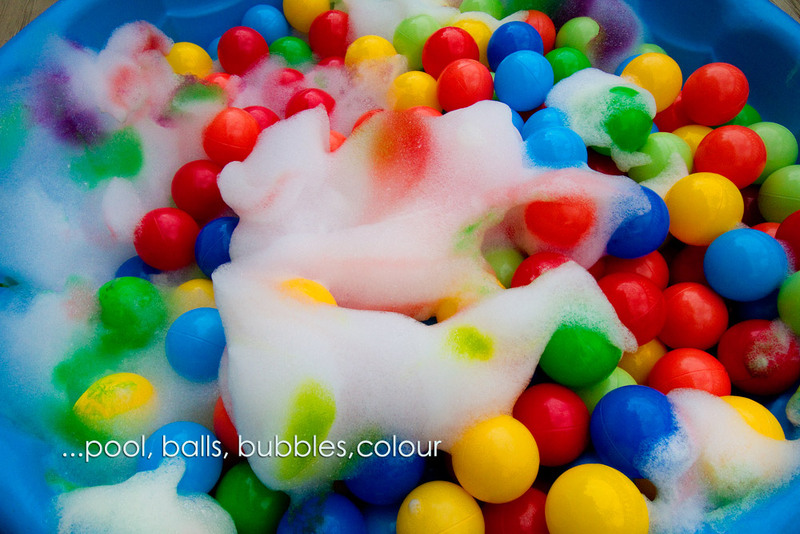 But it will leave stains on your skin, so you can leave it out if you want to have a mess-free play time. Now all you need are the kids! 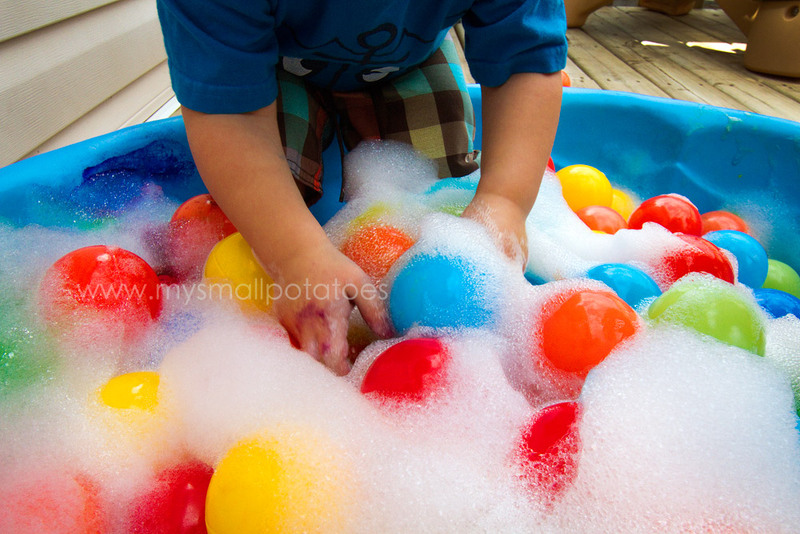 The children that played in our bubble pit today were ages 19 months to 2 years. 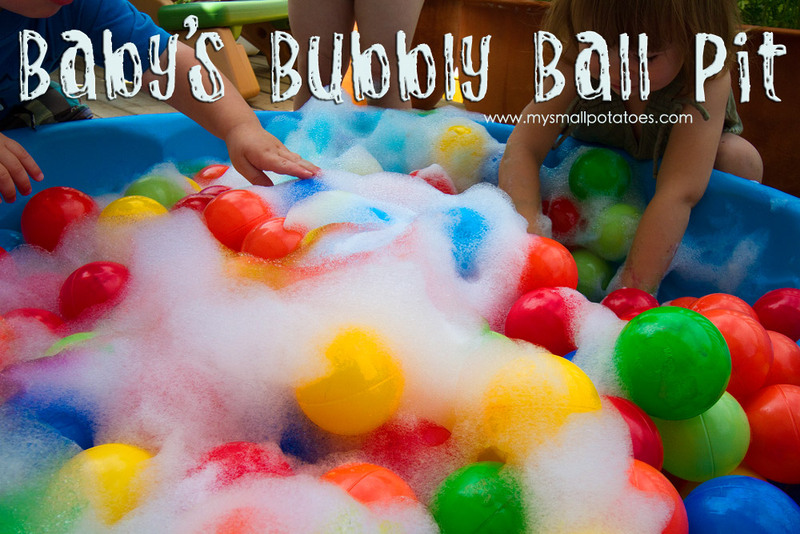 I would not hesitate to let younger ones enjoy this ball pit…if you are worried about the soap getting in their mouths our eyes, just use tear-free baby bubble bath or baby shampoo instead! 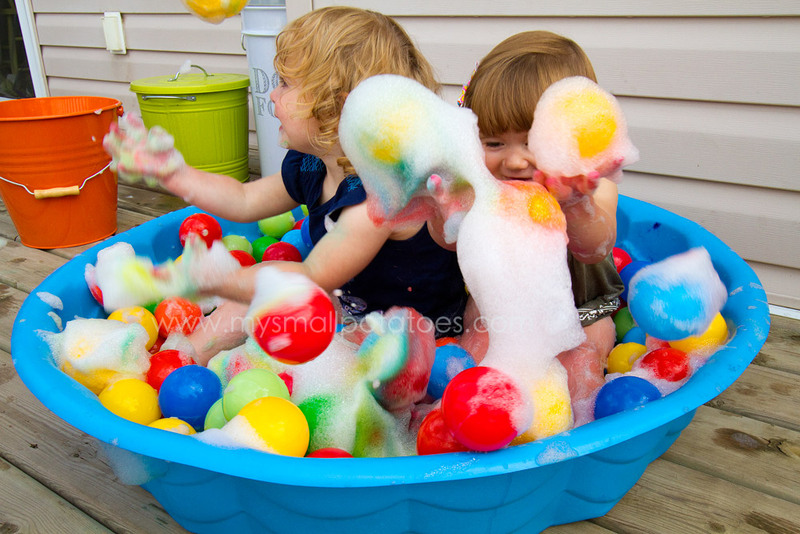 The smalls started out with just their fingers… They squished the bubbles between their fingers and started to dig for balls that were buried beneath the foam. Pretty soon, fingers were not quite as exciting, and the babies got right in the pool! They blew bubbles at one another… And then the ball tossing began!! The tossing of the balls soon lead to the gathering of the balls, and this became the game! Toss and gather, toss and gather! 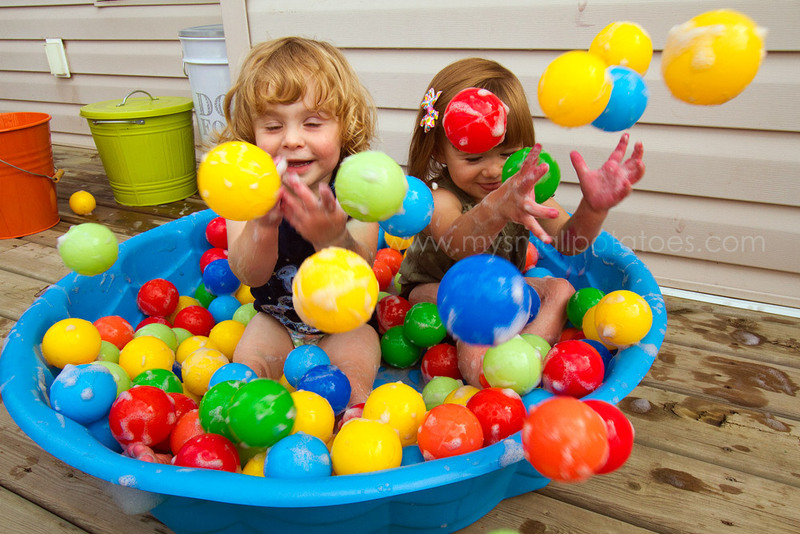 They had just as much fun searching for all the balls on the patio as they did throwing them out of the bubbly pool! As a parent and a caregiver, I highly recommend this activity! 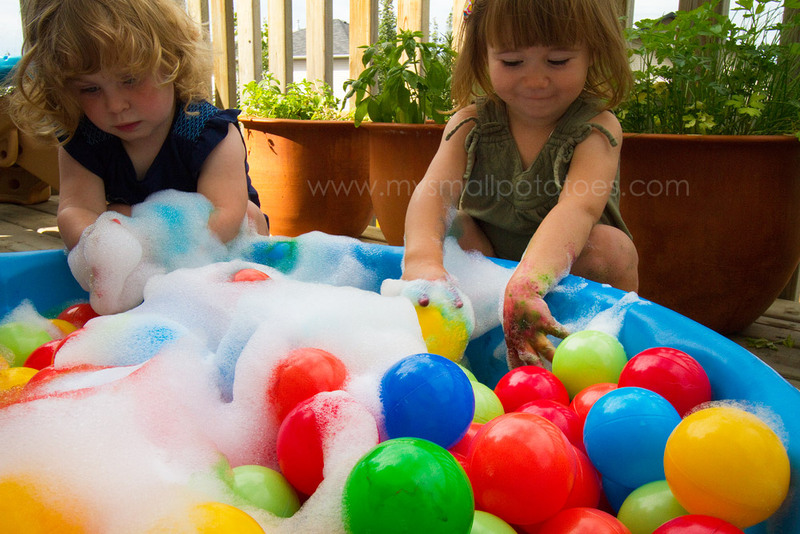 It’s simple to set up, its colourful and inviting, and both toddlers and babies alike will be delightfully engaged for quite a while. 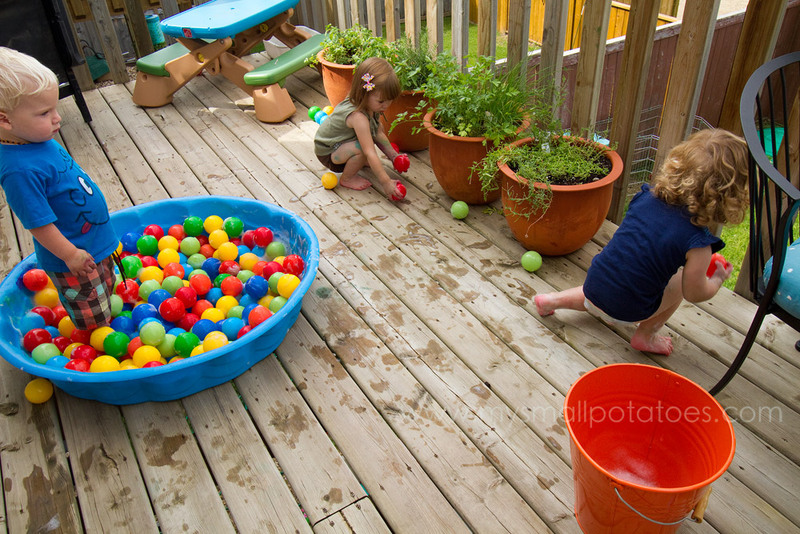 If you don’t have a pool or space for one, this activity can be down-sized quite easily…just use a plastic bin and fewer balls, and set baby and bin down on a splash mat in your kitchen, or out on your stoop, patio, or back yard. You can even do this in your bathtub! 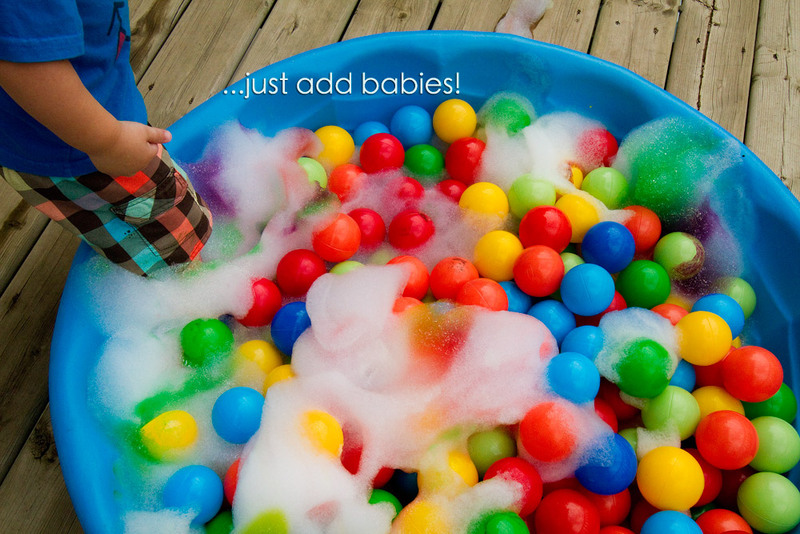 It’s just as fun for your baby to toss 10 balls with bubbly foam as it is to toss 100! You have so many great ideas! I am so glad I found your blog. My littles are going to be so glad too! This is wonderful, Arlee! Great thinking – giving them just the suds! 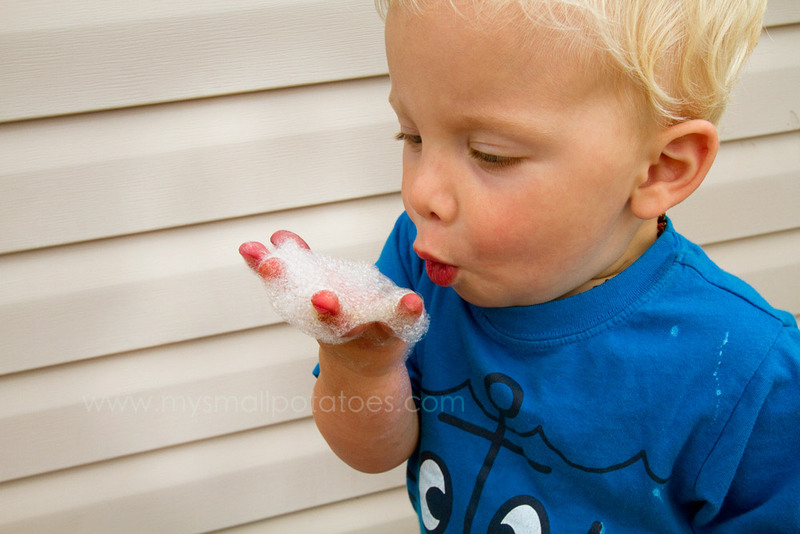 I usually give them soapy water, but the bubbles disappear so quickly! Thanks for the bright idea! What fun and oh, the colors! 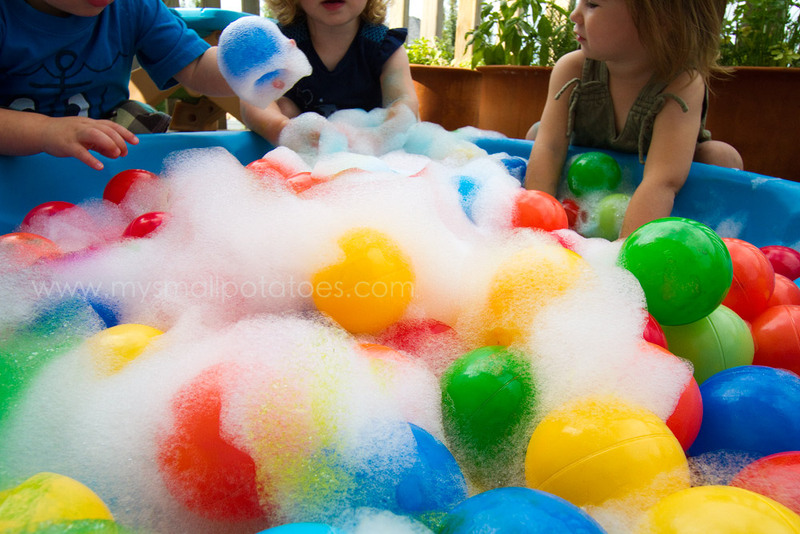 Balloons and bubbles is a wonderful idea.